Aware of the growing threat of bomb-laden mini drones that recently emerged in Iraq and Syria, the US Army is rushing to field countermeasures and kinetic effects designed specifically to defeat drones. 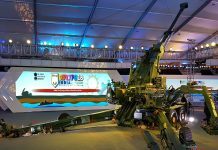 counter-drone capabilities seeking For the ‘Defeat’ part of the engagement, the Army considers “hard kill” and “soft kill” options. Hard kill capabilities employ kinetic munitions to defeat enemy UAS, and soft kill capabilities employ electronic warfare to defeat them. To integrate soft kill capabilities DRS is employing jammers provided by SRC on combat platforms which will soon deploy in support of an urgent operational need. 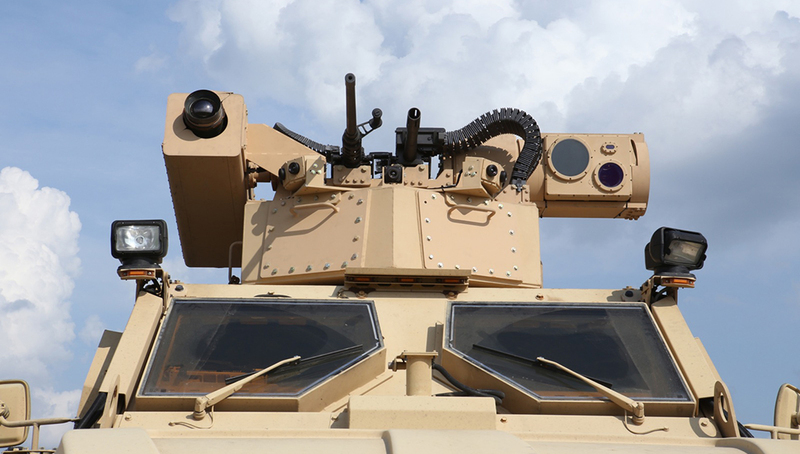 A hard kill system based on remotely operated weapon station employs the Moog Reconfigurable Integrated-weapons Platform (RIwP). The two companies are on schedule to demonstrate this C-UAS kinetic defeat capability in October 2017. In recent years the U.S. Army prioritized the development of three critical components in Counter-Unmanned Aerial Systems (C-UAS) capabilities to Detect, Identify and Defeat enemy drones. At the AUSA convention taking place at Huntsville AL this week, DRS showcases its latest C-UAS capabilities based on the integration of existing and new systems. 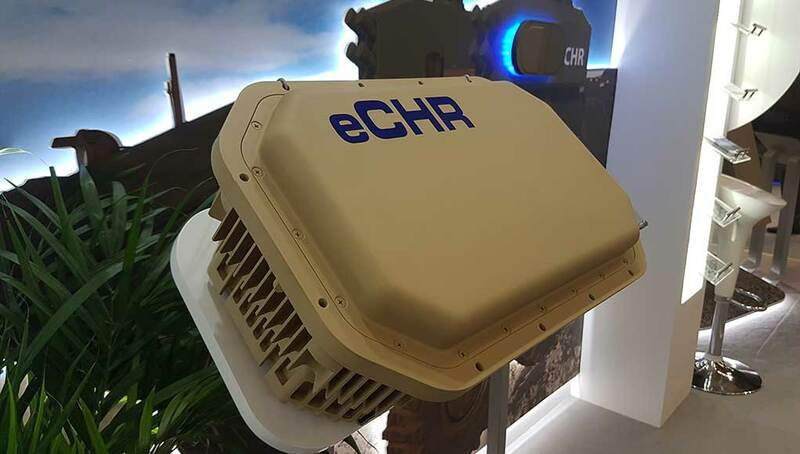 Partnered with RADA, DRS recognized the value of the Multi-Mission Hemispheric Radar (MHR) for the “detect” portion of the C-UAS mission. A small, lightweight, radar, MHR has proven itself as accomplished of detecting “low, slow, small UAS” at several different government tests, highlighted by the Maneuver and Fires Integration Exercise (MFIX) at Fort Sill, Oklahoma, and Black Dart at Eglin Air Force Base, Florida. Recently at Yuma Proving Grounds in Arizona, the MHR excelled at detecting Group 1 and Group 2 UAS at ranges more than five kilometers. 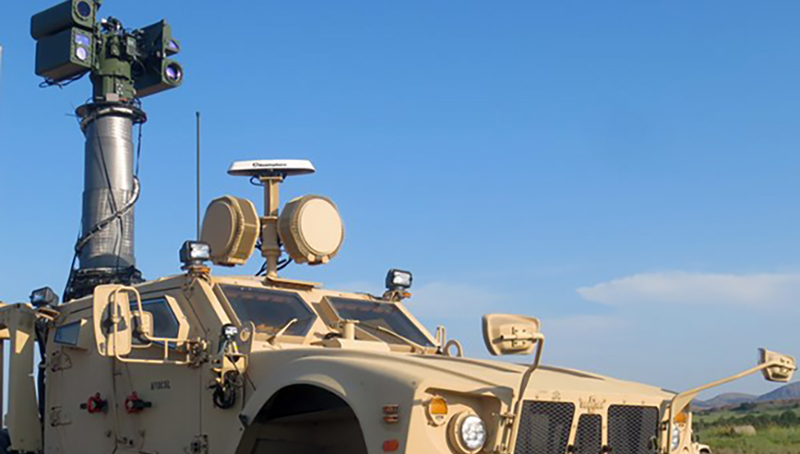 Because of its small size and weight, MHR is a perfect candidate solution for an on-board vehicle mounted C-UAS detect capability which can be optimized to address different threats and missions. The MHR’s ability to cue multiple sensors makes the transition to the “identify” task seamless. Working from the radar cue, DRS developed the software to slew its stabilized, high-quality scout sensor, Surveillance And Battlefield Reconnaissance Equipment (SABRE), to quickly allow an operator to positively identify aerial targets at significant ranges. With the auto-tracker engaged, the operator can zoom in and identify critical characteristics of the UAS such as size, fixed or rotary wing, any large payloads, etc. 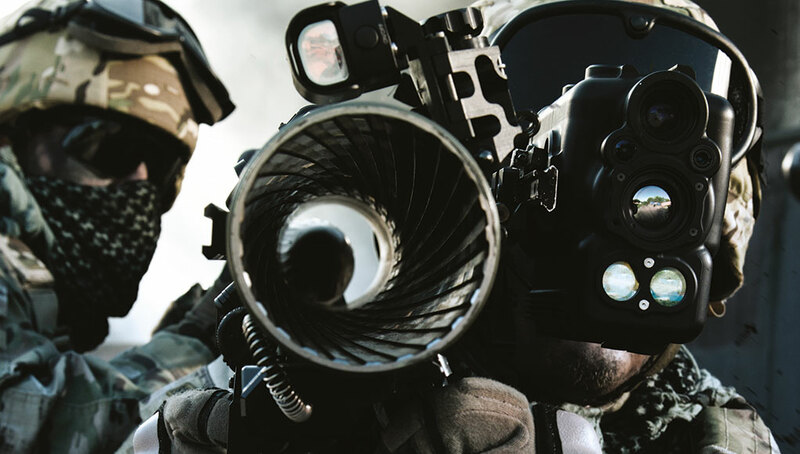 Using existing Army command and control systems, the operator can rapidly populate the common operational picture (COP), warning fellow soldiers of an existing aerial threat. With the proliferation of friendly UAS capabilities at much lower levels in a formation, the air space at brigade level has become increasingly more crowded. Being able to positively identify targets as friend or foe at significant ranges is important, and the DRS SABRE provides that capability. SABRE has also proven itself at MFIX, Black Dart and most recently at the Network Integration Evaluation (NIE) at Fort Bliss, TX. 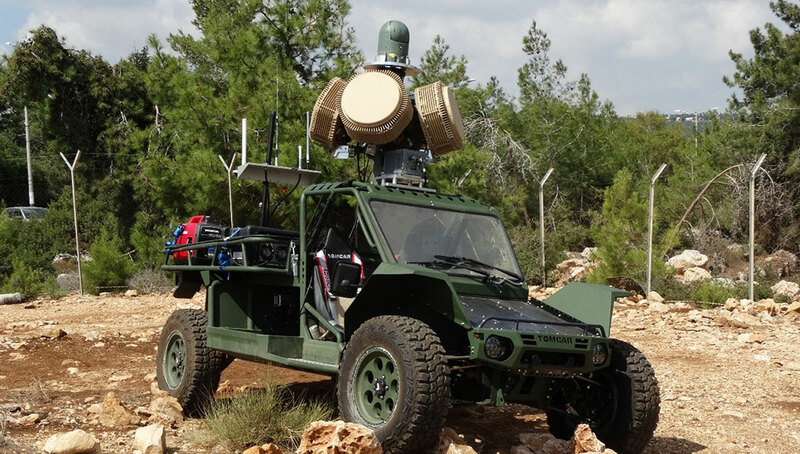 Because of its proven performance and potential operational value as a mobile C-UAS “identify” solution, SABRE was recently deployed to Europe on the C-UAS Mobile Integrated Capability (CMIC) vehicle as part of an operational experiment. Over the next several months, Soldiers will provide real-time feedback on this evolving capability. 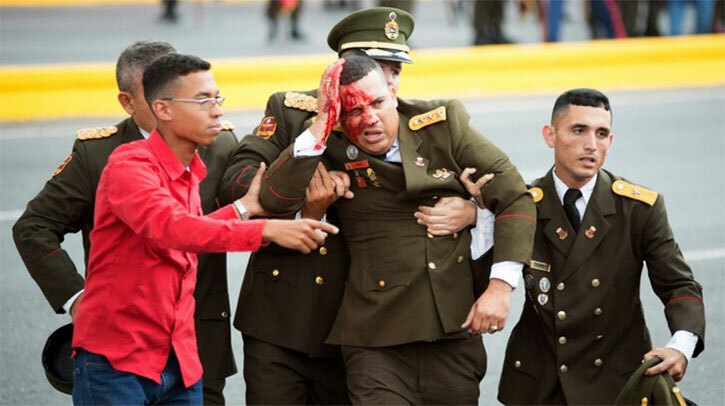 For the ‘Defeat’ part of the engagement, the Army considers “hard kill” and “soft kill” options. Hard kill capabilities employ kinetic munitions to defeat enemy UAS, and soft kill capabilities employ electronic warfare to defeat them. To integrate soft kill capabilities DRS is employing jammers provided by SRC on combat platforms which will soon deploy in support of an urgent operational need. 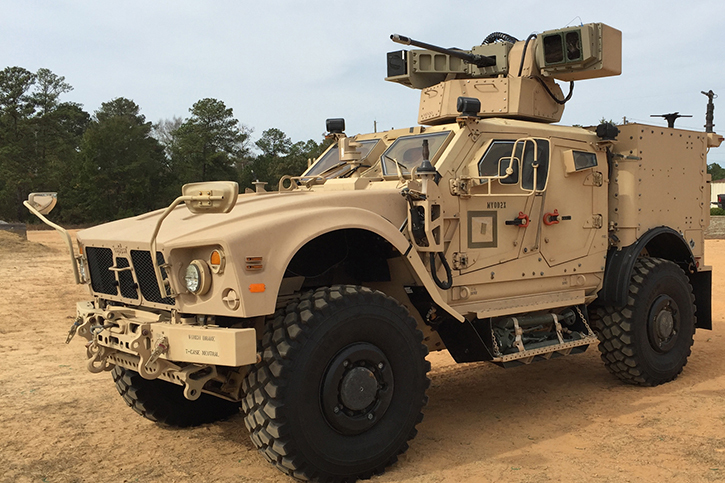 A hard kill system based on remotely operated weapon station employs the Moog Reconfigurable Integrated-weapons Platform (RIwP). The team is on schedule to demonstrate this C-UAS kinetic defeat capability in October 2017. In addition, slewing from cues from the MHR radar, identifying targets using the Improved Bradley Acquisition Subsystem (IBAS) Block 2 sight, will enable ground-based units to engage and defeat drone threats using precision direct fire.